The fluorine repellents having higher repellent performance is used for coating on surface of hearing instruments. As the effect of it, waterdrops tumble down on the surface, and it prevent to enter water and moisture into inside of hearing instruments (so-called capillary phenomenon). Further fluorine repellents can reach to all parts inside the hearing instruments for coating with the pulse-plasma method, so all parts can be protected from humidity and moisture in the air. 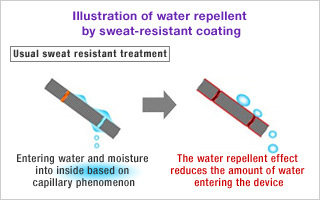 The fluorine repellents to be used for nano-coating have the extreme high repellent performance and low coefficient of friction, which leads the water protection. Further it has superior ability for heat-resistance, chemical resistance and corrosion resistance, so it prevent any bad influence to hearing instruments under various environment conditions. The fluorine repellents make the extreme thin membrane on the surface of hearing instruments. This membrane, as made by chemical bond, hardly peels and strongly protects the surface of hearing instruments. It is not enough for hearing instruments to coat the surface, because rust and corrosion inside cannot be prevented. Nano-coating (special repellent treatment) for Rionet hearing instruments can protect internal components and parts from humidity and moisture in the air, because the fluorine repellents can uniformly reach to every detail corners inside.